Washington, D.C. — In its latest survey of auto insurer website quotes, the Consumer Federation of America (CFA) found that annual auto insurance premiums are especially high for the estimated 8 million low- and moderate-income drivers who finance their car purchases. These drivers must purchase the comprehensive and collision coverage required by auto lenders in addition to the liability coverage required by states. 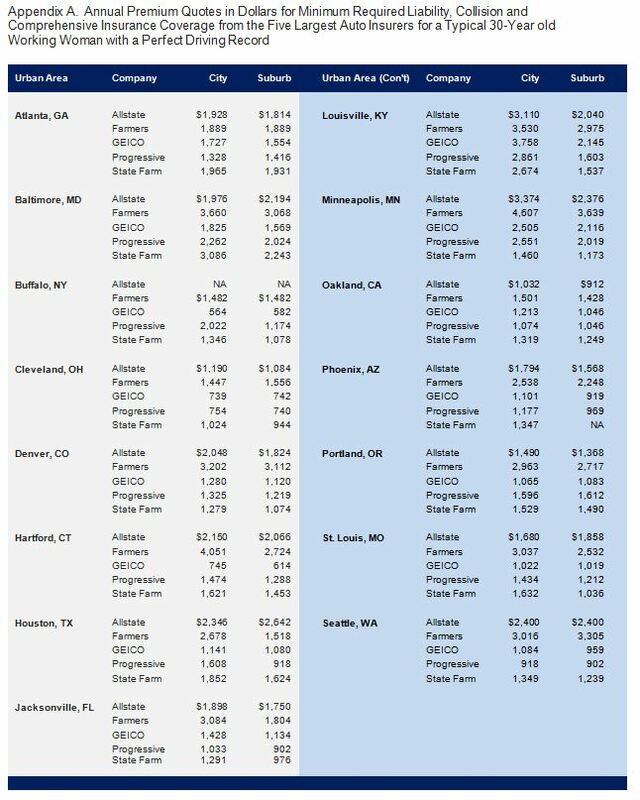 In the 15 cities CFA surveyed, annual premium quotes were almost always more than $900 and were usually more than $1,500. In a related national opinion survey undertaken by ORC International for CFA, nearly four-fifths of respondents (79%) said that a fair annual cost for this auto insurance coverage was less than $750. One-half (50%) said that a fair annual cost was less than $500. Respondents were asked what they thought was a reasonable annual cost for a “30-year old woman with a modest income and ten years driving experience with no accidents or moving violations” for required liability, collision, and comprehensive insurance coverage. “High auto insurance premiums represent a huge barrier to car ownership, and economic opportunity, for millions of lower-income Americans,” said Stephen Brobeck, CFA’s Executive Director. “Researchers agree that they and other Americans, even those in large cities, gain access to better jobs and other opportunities through access to a car,” he added. “State governments, which require drivers to purchase auto insurance, have a special responsibility to ensure that this insurance is affordable in an auto-dependent society,” said J. Robert Hunter, CFA’s Director of Insurance and former Texas Insurance Commissioner. “These governments should create low-income programs that pay for themselves, such as California’s, and also end well-documented price discrimination against lower-income drivers,” he added. For more than a decade, California has made available liability coverage to good lower-income drivers for $226 to $338 a year, depending on county of residence. By law, this program is required to charge premiums that cover claims paid, so is not subsidized by taxpayers or other drivers. No quotes were under $500 per year, and only eight (5%) were under $900, with half of those from Cleveland. Most quotes (76 or 52%) were higher than $1,500. Nearly one-third of the quotes (45 or 31%) were higher than $2,000, and 16 (11%) were above $3,000. GEICO tended to charge the least (e.g., 6 of the 8 quotes under $900) while Farmers tended to charge the most (e.g., 12 of the 16 quotes over $3,000). Within individual markets, huge price ranges typically exceeding 100 percent. “Any economist will tell you that price ranges greater than 100% for essentially the same product reveal lack of true price competition,” noted CFA’s Brobeck. Prices in near suburbs were usually not much lower than those in cities. “As well as denying economic opportunity, these high premiums pressure many lower-income drivers to break the law by driving without insurance,” noted CFA’s Hunter. “We’ve estimated that one-quarter to one-third of these drivers have let their policies, lapse or never purchased them in the first place, because they confront the Hobson’s choice of paying for insurance or more basic necessities like food, rent, or electricity,” he added. The medium-size and large cities were selected to include all areas of the country. They, along with nearby suburban communities (in parentheses), are: Hartford (East Hartford), Buffalo (West Seneca), and Baltimore (Overlea) from the Northeast; Louisville (Lyndon), Atlanta (Morrow), and Jacksonville (Yulee) from the South; Cleveland (Richmond Heights), St. Louis (Florissant), and Minneapolis (Richfield) from the Midwest; Denver (Golden), Houston (Spring), and Phoenix (Peoria) from the Near West; and Oakland (Berkeley), Portland (Milwaukie), and Seattle (Burien) from the Far West. The estimate of 8 million low- and moderate-income drivers – those in the bottom two income quintiles, all of whom have annual incomes under $40,000 – was based on data from the 2013 Federal Reserve Board Survey of Consumer Finances. The liability, collision, and comprehensive coverage, which lower-income drivers are required to purchase, protects other drivers and auto lenders to a far greater extent than the lower-income drivers themselves. The mandated liability coverage pays only for the damage suffered by other drivers in at-fault accidents while the collision and comprehensive coverage required by lenders protects their interest in the financed vehicles. ORC International surveyed a representative sample of more than 1,023 adult Americans by cell phone or landline phone January 8-11, 2015. The survey’s margin of error is plus or minus three percentage points. The survey data are available to press on request.